A children's book writer serves as a mysterious vigilante at night. The problem with this show is the same problem that occurs with a lot of shows derived from other sources - especially those based on comics. The creative types in Hollyweird think they have a lock on all the creativity in the world. 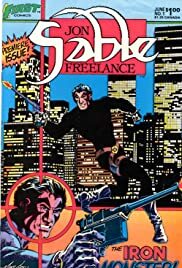 Mike had created a neat set of characters - and no Jon Sable wasn't who he turned into at night - that is who he was - a mercenary who wrote children's books. B.B. Flemm was the name he used when he appeared in public, wearing a wig and fake mustache. There was no idiotic character who walked around with his own laugh track. The show could have been done the way Mike created it and wrote it and the results would/could have been a 10, not a 5. Definitely go to Mike's web site, or better yet - read the comic.